← Bud Abbott tries to teach Lou Costello about the male gaze. On Oscar shows and momentum. 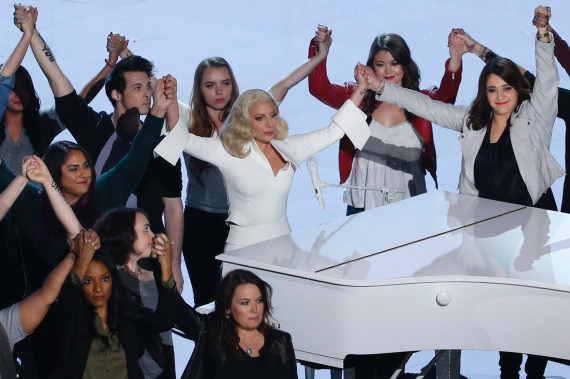 The darnedest thing happened on last night’s Oscars telecast. Lady Gaga had just wrapped up what may have been one of the greatest moments in Academy Award history, a slow build that started with a rousing introduction from Vice President Joe Biden (!) and ended with an empowering parade of survivors of sexual assault, all defiant in their strength. Jaws dropped. Viewers wept. The audience roared in standing ovation. And then, after a commercial break… Gaga lost. It was, simply, the result of bad timing. A little space between her performance and the presentation for Best Song might’ve dampened the blow. But the show’s producers had bet heavily on a Gaga win (she was the favorite; Sam Smith’s win was a surprise to almost all watching) and designed a chunk of their program to build in energy, much like last year’s show built off of John Legend and Common thrilling the crowd with “Glory,” then continuing to thrill with a win. When you can channel the energy into the room, you can make great television. I’m reminded of the 1999 awards, when Robin Williams, leading a gigantic show-stopping production of “Blame Canada,” tore the roof off, built toward a Big Moment… then lost immediately after, to Phil Collins. And that time, they didn’t even cut to commercial in between. Both were the result of bad timing and misplaced momentum. Channeling energy is a risky gamble; if you don’t know the winners in advance, you’re flying blind. It can create a classic Oscar memory, or it can backfire with a major letdown. And I say this as a guy who’s happy Smith won. But there’s the voting and there’s the show, and a Gaga win would’ve been huge for the latter. Speaking of momentum, there’s a problem with lumping all the tech awards together: it can create false momentum. Six awards for Mad Max: Fury Road’s technical prowess makes sense. But six awards given more or less in a row feels like something bigger. It feels a movement. And when the tech categories run out and the show moves on, that movement feels like it fizzled out. The flip side: Chicago won six Oscars, the most of its year, but because its wins were spread out throughout the show, it never felt like momentum toward a favorite. It won a few, then an hour passed with no mention of it, then it won again. Its Best Picture win didn’t have the oomph that night. No in-show momentum. Oscar telecasts are weird like that sometimes. When we look back at past statistics, separated from the big night, we can see a clear favorite, but in the moment? Not so clear. With no Best Picture winner this decade taking home more than a handful of total trophies (The Artist won five, The King’s Speech and Birdman four each, Argo and 12 Years a Slave three apiece, and Spotlight just two), in-show momentum has been hard to come by in Oscar ceremonies of late. So when a movie racks up a respectable pile early in the evening? It’s easy to call that momentum, which means it’s easy to call it a letdown when the momentum stops. So how do producers create a compelling narrative when they don’t know what the winners will be? I guess they can’t. The best they can do is aim for memorable moments, scenes that will engage in the moment and linger in the memory, long after the show’s overall narrative arc has been forgotten. And, sure, Gaga’s loss won’t be forgotten anytime soon. But the temporary feeling of lost momentum will pass, while her performance will linger. Who needs in-the-now television when you’ve got Oscar history?